Police officers tend to hover near the corners of a city, where crime and poverty meet. That way, the long arm of the law doesn't have to reach too far when it knows where most problems are likely to start. In downtown Salt Lake City, officers are in constant orbit of The Road Home shelter, where they regularly attend to overdoses, stabbings and robberies—while struggling to elicit investigative leads from a homeless community generally distrustful of authority. But a few officers of the Salt Lake City Police Department's Homeless Outreach Services Team (HOST) have a different job description: Instead of writing tickets, they point the homeless toward medical, housing and job resources. Instead of throwing the homeless in the paddy wagon and taking them to booking, officers give rides to the homeless for job interviews. It's a vital service, says Salt Lake City Police Chief Chris Burbank, but one he's not sure should be done solely by police officers. "Every morning, we have officers who show up at 5 a.m. and drive about 20 people to get jobs," Burbank says. "We're placing people in jobs and changing their lives, and we're proud to be doing that, but that's an expensive resource that someone else should be providing—but nobody's filling that void right now." The issue came to a head during Burbank's May budget presentation to the Salt Lake City Council. This prompted District 6 Councilman Charlie Luke to seek $50,000 in funding to hire social workers who could do the outreach in a more cost-effective way than HOST officers—freeing up those officers for other duties. Burbank is very supportive of the plan but differs with Luke on a key point—he believes added social workers should help support his HOST officers, not replace them. "If we're actually going to impact homelessness, if we're going to change the dynamic, then we need more people to support the overall mission of providing for these individuals," Burbank says. Luke, however, argues that his East Bench district, that covers much of the foothills and neighborhoods surrounding the University of Utah, is in need of more police officers and questions the need for officers to act as social workers, when actual social workers would fulfill that role better. "When you look at other cities that provide a similar service, none of them are being done by police officers," Luke says. The department did well in filling a void, but now that the system is working, "I don't think that it necessarily needs to be handled by a deputy chief or sworn officers," he says. 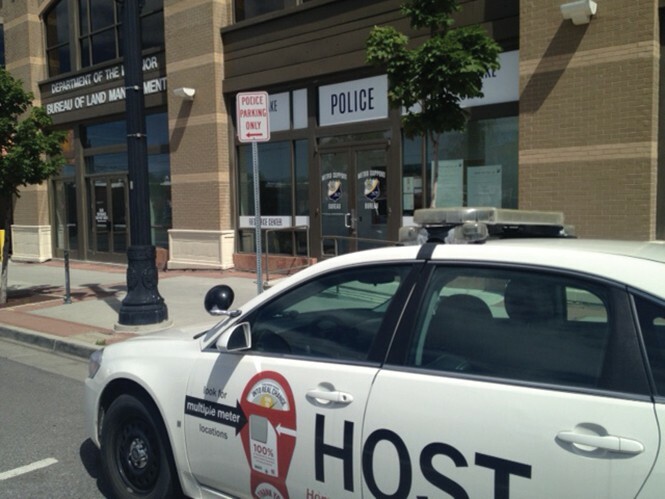 Currently, the HOST team comprises two officers, who report to a deputy chief of the department's Metro Bureau, located adjacent to Rio Grande Street. Burbank says he would like to expand the team to four dedicated officers. Luke, however, hopes those officers could be reassigned. While he lauds the officers for being effective in what they've done, he adds that he is responsible to citizens to make sure that service is provided at the best cost to taxpayers. Not only is it not cost effective to tie up police equipment, patrol cars and salaries in this kind of social work, he says—it's unfair to add this burden to officers. "We ask so much of our officers anyway," Luke says. "This is one thing we can take off their list of responsibilities." Burbank, however, sees the HOST officers as serving a core mission—they just need help, not replacing. He says his two officers juggle a kind of caseload of roughly 400 people each, linking them up with services. Some officers help the homeless get to job interviews, medical appointments and to apply for assisted housing. In some instances, officers have tracked down relations willing to bring their homeless kin in off the street. With case workers, Burbank says, the HOST team would be able to still interface with the homeless, but the case workers would follow up with arranging transportation to appointments. Burbank's officers, he believes, still have a role to play with the existing service providers. "We have a lot of great people doing good work, but we need many more, because the need is tremendous," Burbank says. Zach Bale is the development director for the Volunteers of America Utah (VOA) and has worked personally with the organization's homeless services for years. Bale says he understands that services provided by the HOST team are likely to be more expensive than those provided by traditional outreach workers. But he also sees great value in having police officers project a different image toward the homeless community. He recalls one of VOA's homeless clients was afraid to visit the HOST team because of outstanding warrants. However, after overcoming his trepidation, he did—and, instead of being helped into a jail, the officers helped him find employment. "They helped him get a job all the while they are in their get-up and in their uniforms, and I'm sure that drastically changed his feeling of, 'Does law enforcement exist in my community to help or to hinder me?'" Bale says. For Councilman Luke, however, it is a lack of police resources in his district that remains an overarching concern for his constituents. To that end, Luke, also plans to pushfor the hiring of 25 new officers funded through city money and a federal grant. "We're understaffed as it is with officers," Luke says. "I know the police chief has expressed otherwise, but I've talked with rank-and-file officers who dispute that." Burbank points out that hiring more officers would incur immediate added costs—things like new patrol cars and laptops, things he says the force is already lacking, and for which he has requested funding in the new budget. "We have demonstrated in this nation that it's not about the number of police officers, it's about how effective they are and what they're doing," Burbank says. Hiring a slew of new officers to simply patrol, ticket and arrest people to justify their salaries has, historically, not worked out in Salt Lake City, or the nation as a whole. "It's time to learn something new," Burbank says.